Ibrahim Halawa has been in an Egyptian jail for nearly a year. A protester outside the Egyptian Embassy in Dublin last year. THE JUDGE IN the case of 480 supporters of ousted Egyptian leader Mohamed Morsi, including an Irish teenager, has walked out of the trial, reports say. Anti-death penalty charity Reprieve said that the judge in the trial, which could have seen many of those convicted put to death, walked out this afternoon. 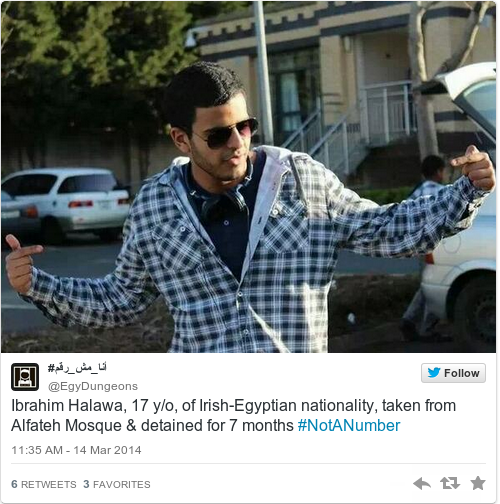 Ibrahim Halawa, from South Dublin, was arrested at a pro-Morsi demonstration last August along with his three sisters, who have all since been released. The charges against him remain unclear, his family say. Today’s events show this ‘trial’ for the farce it really is. We’re now likely to see further chaos and even more delays, but Ibrahim’s illegal detention has already gone on too long. At least 97 people died in last year’s protests in Ramsis in Cairo. Those charged include 12 minors, who were held in detention with adults, in direct contravention of Egyptian law. This trial is little more than a pantomime. In recent months Egyptian courts appear to have been handing out mass death sentences based on flimsy evidence and following deeply flawed proceedings. These show trials followed by mass death sentences are becoming Egypt’s grim trademark. More than 400 of the 494 defendants are charged with murder and attempted murder, offences that are normally punishable by death under Egyptian law. The remainder are charged with offences including destroying public property, protesting without authorisation, attacking security forces and hindering the work of national institutions. Amnesty International has concluded that Ibrahim Halawa is a Prisoner of Conscience, detained “solely for peacefully exercising his right to freedom of expression”. The organisation is calling for him to be released immediately and unconditionally, with all charges against him dropped. “Ibrahim’s case is just one of many cases of injustice being meted out in Egypt’s courts. It shows the government’s determination to flout its obligations under international law,” said O’Gorman. Email “Egyptian judge walks out on trial of Irish teenager”. Feedback on “Egyptian judge walks out on trial of Irish teenager”.